Besides their Tokyo-based division that handled their console and arcade games, Data East also had a pretty respectable pinball division based in the US. Most of their work involved creating pinball tables off of big licenses, like The Simpsons, Back to the Future, and the WWF. 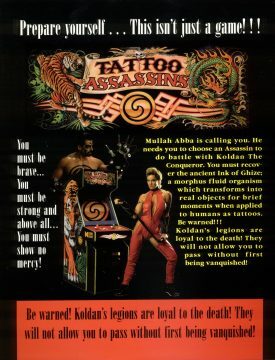 At a time during the 90s when pinball was declining and fighting games like Mortal Kombat were big money, it was decided that Data East Pinball would make an Mortal Kombat clone that would outdo its inspiration in terms of gore and secrets to be found. 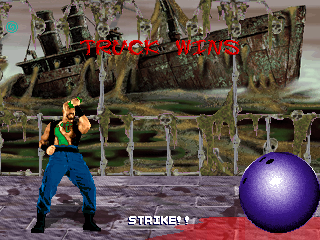 The only problem was that the employees of Data East Pinball weren’t really familiar with creating video games. 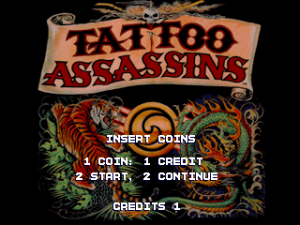 To be blunt, Tattoo Assassins feels like one massive joke of a game, more of a big prank than something that actually exists. Whatever criticism gets thrown at the game can be partially deflected by the fact that it was cancelled before it officially released, leaving the gaming public to only discover its magic after MAME came into existence. It did, however, apparently get close enough to release that EGM made a pretty in-depth article about it, so the developers still had a little too much confidence in their product. 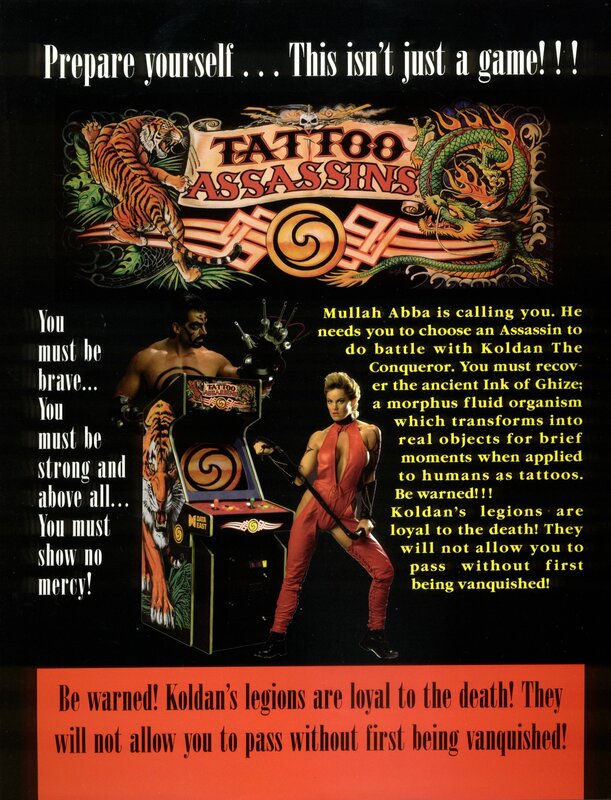 While it’s a shame if any game gets cancelled, it wouldn’t be too harsh to say that Tattoo Assassins was never going to make any big waves against games like Killer Instinct. The plot, such as it is, was actually written in cooperation with Bob Gale, screenwriter for the Back to the Futureseries. 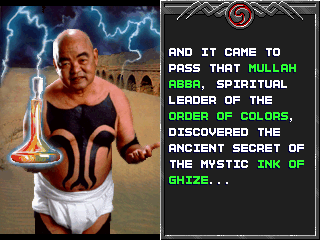 A mystical order discovers that the mystical Ink of Ghize, if you paint tattoos on certain people with it, can temporarily turn into real objects. The generically evil Koldan steals the secret of the ink, intending to use its power to enslave mankind. Only nine people are also compatible with the ink, eight of which are possessed by Koldan’s power. There’s your excuse to go murder all the other fighters, defeat Koldan’s mutants, and probably kill Koldan himself, because the game isn’t particularly hard. 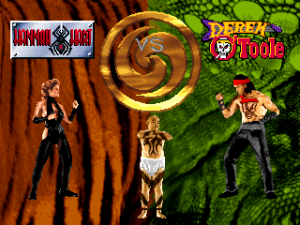 All of this, by the way, is ignoring the short person in his underwear who appears throughout the game, as well as the fact that you select your character off of a woman’s bare back. The characters themselves are similarly confusing, to say the least. The highlight would have to be Karla Keller, an ice skater who’s a spoof of very much real person Nancy Kerrigan, down to having a rival who attempted to sabotage her career. Pretty distasteful, that. 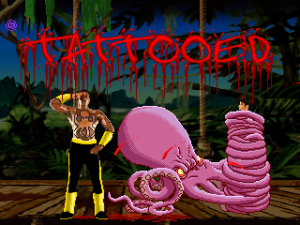 You’ve also got Luke Cord, ex-Navy Seal who looks a lot less fearsome with the cartoon octopus on his chest, vengeful stripper Hannah Hart, and fat, bottle-chucking biker Truck Davis. There’s also the typical Native American stereotype in Billy Two Moons, who goes the extra offensive mile by actually scalping his opponents. All of them have backstories that briefly mention being betrayed by somebody or seeking revenge, absolutely no resolution to which appears in the game or its endings. The controls take almost directly after Mortal Kombat 2, with four buttons for high and low buttons, along with the distinctive block button. The only difference is that before a match begins, you can select a certain special move that’ll be mapped to its own separate button. This would be interesting if not for the fact that not only can you only use this button five times per round, but all these selectable moves are ones you can perform at any time using regular inputs. So, you’re basically left with a button that saves you the hassle of pressing ‘back, forward, high punch’ five times. Look out, Darkstalkers, we’ve got a real innovator here. Even the basic moves, such as sweeps and uppercuts, are performed the exact same way. On the other hand, every character does have the ability to turn around and fart on command, which knocks the opponent backwards, but deals no actual damage. 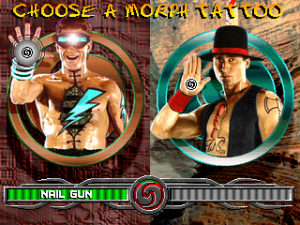 It’s exceedingly difficult to not just call Tattoo Assassins “Mortal Kombat II, but worse” and be done with it, because so much of the gameplay is ripped straight from that game. In terms of absolute gameplay, it’s at least functional. The controls work well enough, and special moves are generally never more difficult than ‘down, forward, low punch’. 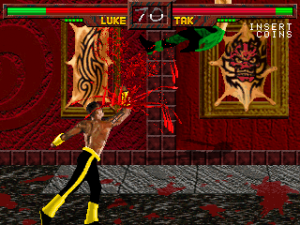 The AI generally isn’t as difficult as what Mortal Kombat would put you against either, and most opponents can be beaten through the liberal use of jump kicks and uppercuts. Not even Koldan himself is much of a threat, and you’ll probably get him to skeletonize and explode violently in just a couple of credits. He’s the final boss of a Western fighting game, so he has to die as dramatically as possible. It’s the law. But you’re not here for the gameplay, that’s pretty certain. 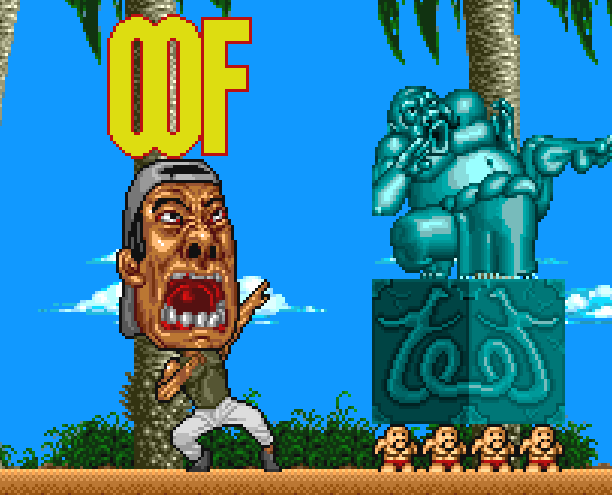 You’re here to see the fatalities, of which the game claims to have 2,196 of them. That’s pretty much a lie, unless you count every single character using every single fatality available, but there are at least a lot of them. So many, in fact, that you’re almost guaranteed to get most of the game’s finishers just by mashing buttons. While every character has a few specific fatalities, almost all of them share a good number of universal finishers, and these are the ones that are worth finishing an opponent with. Unfortunately, they’re all pretty terrible, although some of them at least make up for it by being hilarious. The finishers where you actually kill your opponent are generally the lamest, especially when you have so many other options. 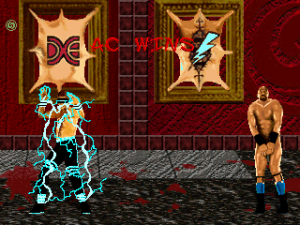 You can perform a literal Nudality on your opponent, although nothing explicit is shown. You can shame the name of BurgerTime by dropping a hamburger from that game onto your foe. 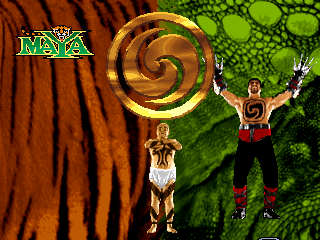 You can turn your opponent into the Mona Lisa, make them wear silly outfits, or make a two-headed Barney the Dinosaur erupt from your chest. 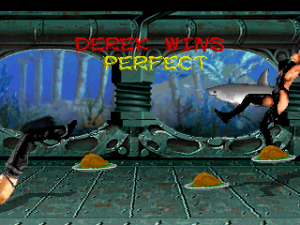 and, the highlight, fart out a cooked turkey dinner, which, every time it collides with an opponent, multiplies, until the screen fades out on the two fighters getting knocked around the screen by a couple of dozen fart turkeys. Truly, video games are art. Not that there’s not a lot of goofiness to be found in the rest of the game, oftentimes difficult to tell if it’s supposed to be that silly, or if it’s part of the game’s unfinished nature. Watch Luke’s grenade attack bounce right off of your guarding character and back at him. 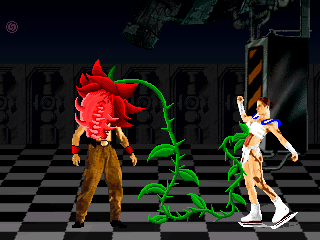 Enjoy how both male and female characters alike make the Wilhem scream upon being uppercutted. Marvel at how one of the game’s subbosses, some kind of crystal man, can be defeated in literally four jump kicks. 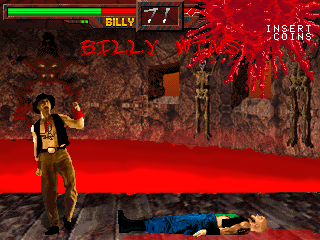 Witness the game’s Native American character threatening to scalp then-president Bill Clinton in his ending. The entire game has the sort of tone of people who just literally didn’t care, and in a way, that’s oddly charming. 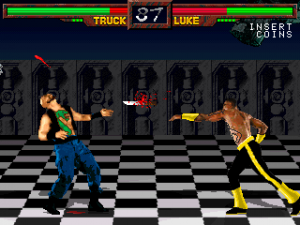 In terms of graphics, the characters tend to have less frames than your typical Mortal Kombat character, leaving their animations choppy. 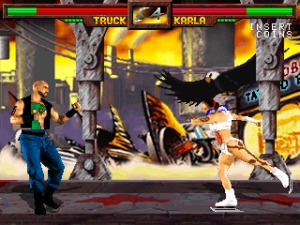 The backgrounds are simplistic and don’t have any animation to them, with the only real highlight being the outside of a tattoo parlor that has a giant bald eagle draped over the front. The graphical highlight would have to be the fact that the health bars explode messily into blood when somebody runs out of health, and even then, Primal Rage did that far better. The music, a waste of the talented Brian Schmidt, is so muted it might as well not even be there, and characters are often missing sound effects or make grunts from the wrong gender entirely. At least they managed to get Koldan to shout out “NOT!” properly every time he appears on the fighter lineup. Tattoo Assassins is a bad game, and it wouldn’t be much of a stretch to say that it might well be the worst game Data East ever released. Not even the developers had any enjoyment being involved with this game, and there are various candid interviews about the game’s troubled development across the internet. It makes for some fascinating reading, far more than the game itself. Again, considering that this is still a game never commercially released, some understanding should be shown for the game’s myriad problems, although no amount of leeway will ever make this a good game. Still, for comedy value, intentional or otherwise, it’s a great thing that something like this has been preserved for future generations.